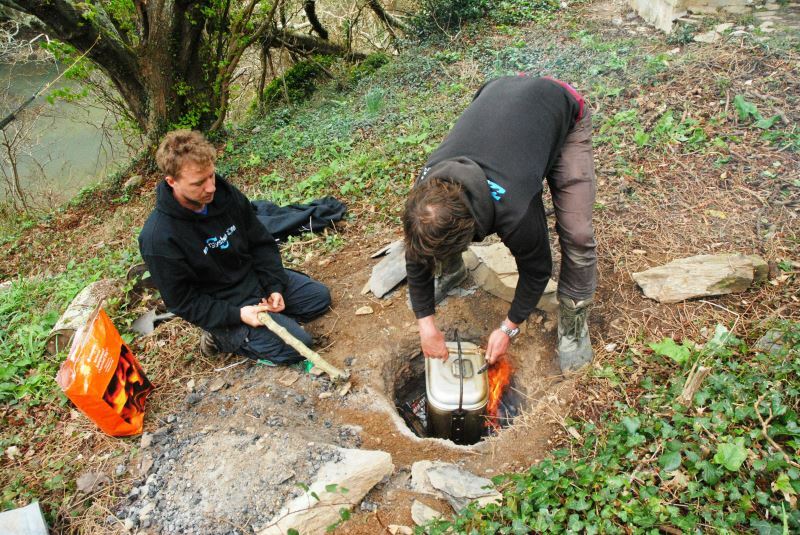 Caveman style cooking: Guaranteed to impress your mates. This is one of the simplest and oldest cooking traditions available. Imagine the look on your guest’s faces when they see you pull a steaming pot-roast out from a pit in the ground, accompanied by amazing smells, having been slow cooked for 5 hours. How to make an underground oven. 1. Dig a hole the size of a dustbin lid, about 1.5-2ft deep. 2. If you have the time, line the pit with clay or slates - though not entirely necessary. 4. 20 minutes before your main fire is ready, start a small fire IN the hole. Only use small kindling as the air flow in the pit will be limited and small fuel burns easier. This small fire is a bit like 'warming the pot' before making a pot of tea. 5. Get your large container of pot roast heated up and ready (using the oven or gas hob, see recipe below) and once the main fire is ready, use a spade or shovel to push all the red hot embers into the pit. 6. Place the food container on top of the embers. Put the last few shovelfuls of embers round the pot and place large, thick stones over the whole lot to keep the heat in. If your fire has been big enough, the heat should be over 100 degrees for at least 3 hours and after 5 hours your leg of lamb, venison, beef joint will just fall apart and all the juices will have mixed with your root vegetables. THE EASIEST RECIPE IN THE WORLD! - Venison pot-roast for underground oven. 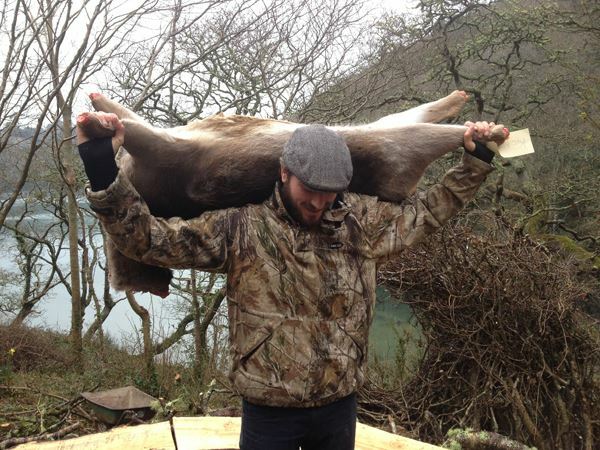 - Allow 200g of venison per person. Preferably shoulder or leg joint (large) for 12 friends to share. - 2/3 onions roughly chopped. - Root veg: 2/3 carrots, 2 large parsnips, swede and potatoes - whatever you've got! - Wild mushrooms - Preferably Ceps (aka Penny Buns) dried or fresh is fine. - Handful of Thyme, preferably Wild. - 3 Garlic cloves, chopped. - 2 Litres of vegetable stock. - 1 Pat salted butter. - 1 Glass red wine. - 6 Tbsp veg oil. Chop all veg roughly and place in a large thick aluminium pot, along with all other ingredients and the stock, then..... Cook for 5 hours. Time is your friend here. As long as the underground oven has enough embers and residual heat within the walls, it should maintain a rolling boil for 1.5 - 3 hours. And, it will still be piping hot after 5 hours, at which point your meat will fall off the bone and all the juices will have been absorbed by the root veg. Serve piping hot in large wooden bowls, topped with freshly chopped wild garlic or chives, around the campfire, with friends and home brewed elderflower wine.